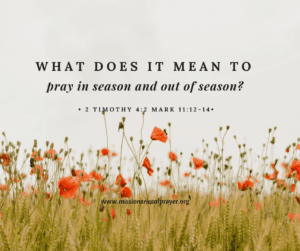 Home»Prayers»What does it mean to pray in season and out of season? This basically means that you must be ready to share the word with someone at all times. You must be ready to pray at all times. This story is Jesus cursing the fig tree. Notice that it says it was not the season for figs but still Jesus was hungry and the tree should have been ready at that moment to bear fruit and feed him. Likewise, we must be ready to pray for others whether or not it is convenient to us. We must be ready to share Jesus with others when we notice they are “hungry”. This is why we are saved to be ready to preach the word in season and out of season and to pray at all times as well. Here is a prayer for you. Father God, may we be ready in season and out of season to share Your word and to pray for others. Let us not be embarrassed or think that it may not be a convenient time. 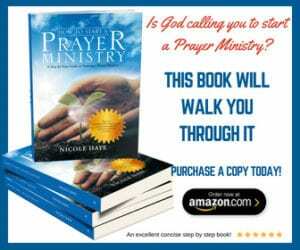 It takes nothing from us to ask”May I pray for you?” when we someone distressed or in need. May we be ready at all times to be used by you. May we bear fruit at all times for you. So that we may increase more and more. May we never hide the talent that you have given us but invest over and over again in the lives of others. We pray you give us boldness and equip us through daily reading of the word, in Jesus Name, Amen.